It was the primary form of clothing in the earlier era of the shinobi. Some shinobi, particularly the Akimichi clan, as well as Hiruzen Sarutobi, wear plated armour when going into combat. Its most obvious use is as protection from bladed weapons, blunt trauma, and some techniques. Due to the hardness of the armour, it can also be used to strengthen the power of physical attacks if the metal connects with their foe. It seems that armour can be personalised to a certain degree, as the Akimichi have the kanji for 'food' on their armour. Armour can also be worn under a shinobi's usual clothes, although this means that less armour can be worn, usually in the form of iron meshed clothes. The ANBU also wear reinforced chest armour along with arm guards. More modern shinobi also tend to wear mesh armour underneath their clothing. Cost: 500ryo (if custom made)/ free if its earned by gaining Captain of Anbu rank. Cloaks are actually some of the most versatile clothing available to ninjas. They can serve many purposes, such as being ceremonial clothing, a sign of status, to conceal one's body and weapons, or as protection from weather. These can also come in a variety of designs. Cost: Always receive one once becoming a chunin. Flak jackets are a form of protective clothing designed to provide protection from such things as blunt-force trauma or even bladed weapons, shrapnel and other projectiles or weaponry. They are usually worn by chūnin and jōnin over their normal clothing in most villages, although the design varies among the villages and have also changed over time. Cost: Always given out when ninja reaches Genin Rank. The most important article of clothing for any and all shinobi is their forehead protector. 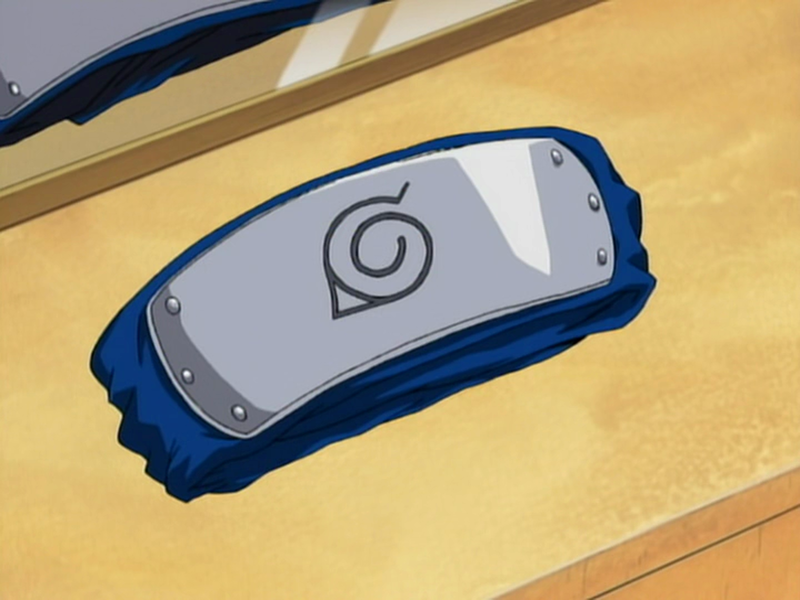 This headband signifies where the loyalty of a shinobi lies. It also signifies equality among shinobi of the same village. In order to be considered an official ninja, one must graduate and earn one of these headbands. The missing-nin of Akatsuki puts a scratch across their village symbol on these to signify their defection from that village. They can also serve a practical purpose, acting as protection for a ninja's forehead whilst in battle. Notably some shinobi aren't seen wearing forehead protectors, mainly in the Naruto filler arcs and after Sasuke left his behind after the fight at the Valley of End. The full body suit is simply a single form-fitting piece of clothing that covers everything except the feet, hands, and head (although the ones used by the ANBU reveal the arms from shoulder down). It seems that it would allow stealthly movements, and the ones worn by Lee and Guy are claimed by the two to allow full movement, retain moisture, and is breathable. These seem to have no real downside, although Guy and Lee's seem to have the comical effect of making their backsides look larger. Cost: Usually given to Genin upon Graduation. Used as storage for many tools, hip pouches are necessary for holding an assortment of all the most elementary of ones ninja tools such as kunai, shuriken, scrolls, explosive tag and smoke bombs. Cost: 1,000ryo (Custom made) also must be made once you become an anbu rank. The ANBU wear ceramic masks to hide their identities. These masks come in a variety of designs, all of which resemble animal faces. In one episode, Naruto was able to buy a mask like these whilst searching for Tsunade with Jiraiya. Other ninja such as Tobi have also worn masks to conceal their identity, and Kakashi has covered part of his face with a mask since childhood. Most samurai wear protective masks as a defence against airborne toxins such as Poison Mist. Cost: Given to all medical Ninja. Konoha Medical Field Ninja, such as Sakura Haruno and Ino Yamanaka, are seen sporting their own version of the hip pouch. Like their generic counterparts, the medical pouch is worn on the back of the wearer's rear. Unlike their counterparts, however, the medical pouch covers the whole width of the wearer's rear-end. This provides the field medical ninja with more space to transport medical supplies into the field to administer emergency first aid. Both Sakura and Ino also wear their tantō above their medical pouches when on missions. Cost: Given to medical ninja upon becoming one. The Konoha medical-nin have been shown wearing an off-white robed outfit over white-beige clothing. This seems to serve no other purpose other than to allow others to discern medical-nin from the usual ninja. Cost: Given to ninja upon graduation. Similar to a hip pouch, the weapons holster is designed for holding kunai and shuriken only. Positioned on the thigh, the holster is conveniently placed for the quick-drawing of the kunai or shuriken they carry in combat. Cost: 500ryo, custom made per customer. These hats are simply circular hats made out of straw. However, these can be used to hide one's identity, or as a way to protect oneself from unpleasant weather. The hats worn by the Kage are similar in shape, but different in composition.